Based out of the Twin Cities, The Dust of Suns will take you to a different time and place with all original waltz musettes, magical tangos, and sweet melodic miniatures. Though the piano-led group resembles a chamber quartet, they’re playing popular music, but pop whose touchstones mainly predate rock of the sort Lynch grew up with and has most prominently performed. 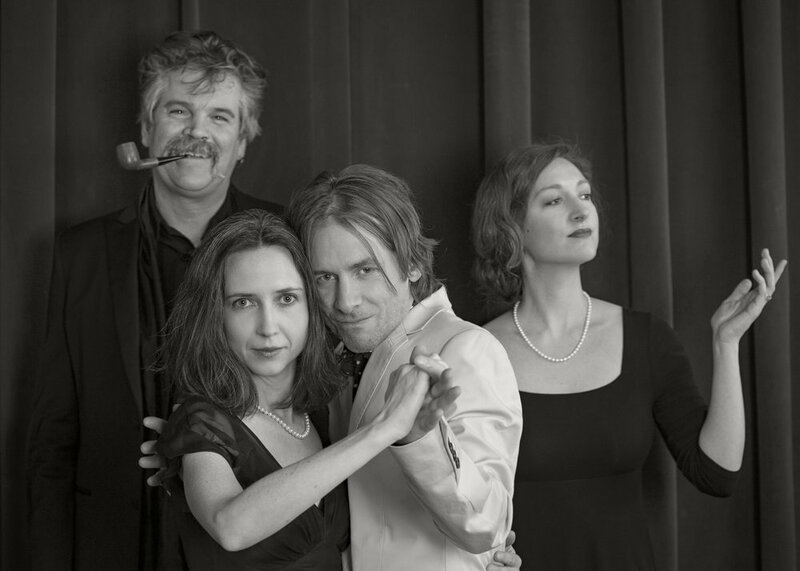 On their most recent album, Eventide and its predecessor, Dreams for Hannah, Lynch draws on bal-musette—French accordion music springing from fin de siècle bars and between-the-wars bohemian cafés—as well as Erik Satie, classic American and French film scores, music boxes, lullabies, klezmer, and a few irrepressible harmonies and melodies redolent of the pop-rock Lynch loves with equal enthusiasm. Though Lynch writes all the music and guides the group’s sensibility, the arrangements are worked out collectively with harpist Phala Tracy, cellist Anna Lee Roberts, and upright bassist and producer John Munson, best known for his work in Semisonic, the New Standards, and Trip Shakespeare. These short, hummable pieces—Lynch is right to call them songs—are mostly waltzes, though the wistful title track and a few stray measures are in common time. Lynch maintains the dominant three-four pulse with frequently arpeggiated left-hand chords and keeps his right-hand melodies lyrical and relatively simple. These are gentle, expressive pieces—though they derive from different sources, they sometimes bear a kinship with Chick Corea’s Children’s Songs. While there’s a charming sepia tone to the project, it doesn’t feel reproductive; this is idiosyncratic, living music, evocative as background (“furniture music,” as Satie put it) but worthy of close attention. As with Dreams for Hannah, the album was recorded live—with very little overdubbing and editing, that is—to analog tape. Now, for the first time, the dreamy music of Chris Lynch and the Dust of Suns Ensemble can be enjoyed over brunch in the charming and cozy space of Black Dog Cafe of Lowertown, Saint Paul. Suggested $8 cover ensures that the music endures.